At DMVS we stock a wide range of tyres for most models, in a variety of makes. Our tyre bay has been re furbished with the very latest in tyre changing equipment and computerised wheel balancing machines to cope with the latest in low profile tyres and alloy wheels. Our experienced and friendly staff will be happy to help and advise you. Should you require a quote just click here and enter the details of your tyre, including manufacturer and size and we will email you back with prices, alternatives and availabilities. What information we need ? 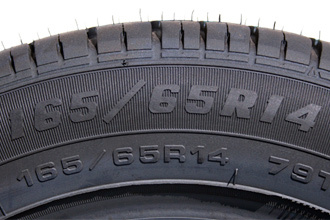 We need the tyre size, which is embossed on the side wall of your tyre. HELP? We are also equipped with the latest state of the art laser wheel alignment unit to aid you getting the best from your tyres in terms of both performance and tyre life. The law requires that your vehicle is fitted with the correct type and size of tyre for the vehicle you are driving, and for the purpose it is being used. This means fitting the right tyres, and for safety, ensuring that they are inflated to the manufacturer's recommended pressure. The legal limit for minimum depth of the tread on your tyres is 1.6 millimetres, across the central ¾ of the tread, around the complete circumference of the tyre. For safety reasons it is recommended that you replace your tyres before the legal limit is reached. Many vehicle manufacturers recommend replacing at 3 millimetres. In wet weather it takes an extra car length (8 metres) to stop at 50 mph than if your tread was 3 millimetres. A regular check of your tyres can help you to avoid 3 penalty points and £2,500 in fines (per tyre) for having tyres worn beyond the legal minimum limit on your vehicle. Your insurance is also invalid if you have an accident when driving on illegal tyres.